Do you guys have any big plans for New Year's Eve? I will not be wearing red high heels like in this picture, that's for sure. LOL! We will probably go out to eat and come home and watch the celebrations on T.V. That's just about all we do every year. I can't believe Christmas is over! I'm always a little bummed afterwards. When I was little, I used to cry. Now I want to cry thinking of all the "stuff" I have to lug back up in the attic. lol! It's just not as much fun taking everything down. You all have a Happy New Year!!!!! I hope you all had a Merry Christmas! We sure did! 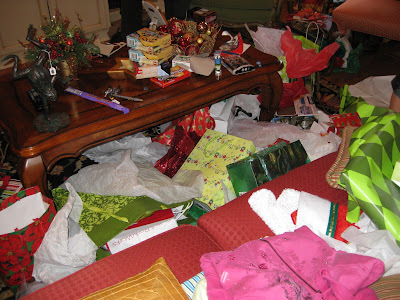 My family came over and we ate, listened to Christmas music, and opened presents it was alot of fun! Santa brought Chase just what he wanted, Guitar Hero world tour, or should I have said just what DAD wanted... ;) It looks like Santa liked Melissa's peanut butter balls, yum yum. For you dish ladies, I know the spring plate does not go with the Christmas plate, just grabbed something... lol! Chase had a few questions for Santa, you can click to enlarge it to read what he wrote. It was so funny! Here he is EARY Christmas morning. I think I was still asleep when I took this picture. He was so excited and hardly slept at all on Christmas eve. Neither did I! lol. That took a while to clean up! 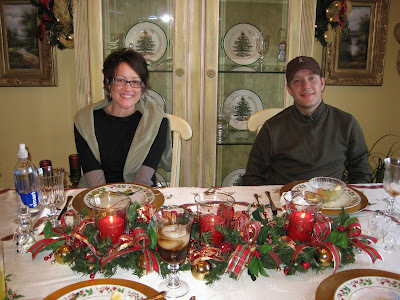 This is my brother Daniel, and his wife Liberty after we ate a late lunch and were stuffed! In the midst of the Christmas frenzy we all remembered what Christmas is all about. I hope you all did too. I have family coming in from Kentucky next week so we get to celebrate again. 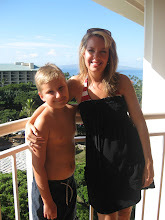 Oh, and I did get a new digital camera, so maybe I will have clearer pictures. Happy New Year!! 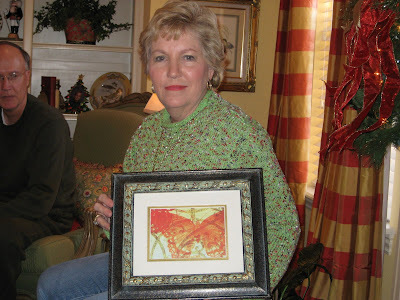 Thank you Susan at http://betweennapsontheporch.blogspot.com/ for hosting Tablescape Tuesday. Check out her blog for all of the participants. I have to admit, I really don't have alot of dinners at my house. We usually go to my parent's since there is more room. This year, however, we are eating here, so the table will stay just like it is for Christmas dinner. The plates you see on my table are from.......The Dollar Store! Yep, I got them when I moved into this house about 4 yrs. ago. So many of you have such gorgeous china, I need to invest in some, but for now, these will have to do. The napkins came from T.J. Maxx, I picked them up a few days ago. The tablecloth came from J.C. Pennies last year. The centerpiece is made out of a thin garland that I shaped to fit around the candleholders. I added ornaments, apples, and ribbons. You can now click on the pictures to enlarge them. I made the napkin rings out of beaded and bell garlands. After I took these pictures, I tugged on the tablecloth and streched out these wrinkles! lol! See the crystal snowman? He's one of my favorite Christmas pieces. I spy a crystal mouse! I've been meaning to show you my front door and snowmen, there's Sassy peeking out! I wish you all a Merry Christmas and a Happy New Year!! Thanks for your visits! I just did some decorating at my parent's house today. My mom had already set some Christmas things around. I just decorated the tree and put up some garlands. They have lived in this house for about 8 yrs. It is really pretty and has a great view. In case you are wondering, those are horns in the arrangement. The tree has a spirtual theme with angels, nativities, fruit, butterflies etc. No Santas or snowmen like in my house. LOL! I think she would rather me have this theme. Remember my gold tree mom? Mom, hurry and wrap all of my presents!! he he he! The tree is bare! Only 5 more days! Merry Christmas! This tree was a 12 footer! It took a good 4 hours or more to decorate it. The top was really hard to get to, but did the best I could. it's a little crooked in this picture, but they straighted it up I'm sure. Here are the stairs. Rather than doing bows, I just cut the ribbons to make it a little more contemporary. I barely had enough ribbon! Next year I might put the same stuff in the top of the tree throughout the garland. Some of you asked about the piece in the middle of the lamps....it's a sculpture made out of wood. It's very interesting and unique! I really love this light fixture by itself, but the garland, ornaments and ribbon just added to it! This house was a lot of fun to decorate. Maybe not the tree, LOL! It was huge! Hope you enjoyed seeing something a little different. I think all the homes I have done have been different from each other. That's what makes each one unique! Oh my goodness, I just realized Christmas is in 9 days! I've still got a lot of shopping to do! Hope you all are enjoying the season! We have a winner!!! Thank you all for entering for the Christmas tree frame. I wish you all could have won, but then I would have had to make ALOT of frames and I would be broke!! LOL. I will have more drawings on down the road. I put all of your names in a bag and gave it a good shake, then Chase drew the winner! It's Miss Janice from Etiquette with Miss Janice. The drawing was done fair and square..... one draw, one time. Congratulations Miss Janice! E-mail me your address and I will ship it right out. I know I said my text would be underneath, but I'm still trying to figure all of this out, please bear with me. LOL! Also, I listed a few more Christmas frames in my Etsy store if you would like to take a look. Here are the rules for the Christmas award. 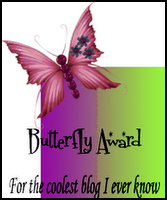 I really was going to nominate 10 of you, but I think most of you have recieved this..... but if you haven't, please take it, because you deserve it! Here are a few more pictures of my friend's house (Bo's momma) that I showed you a few weeks ago. 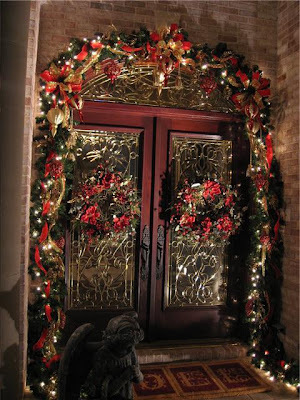 I used bright red and gold ribbon and big ornaments around the door. The kitchen is really pretty! The baking santa is a Mark Roberts piece. This is the fun tree in the family room. It has a little bit of everything on it. I tied the ribbon on the branches for something a little bit different. This is the formal living room. I showed you a similar picture in the earlier post. Doesn't she have a beautiful home? I thought I would take a quick break from decorating pictures and show you my best friend's dog, Bo. He's a Portuguese Water dog and boy does he have a funny personality! The first picture of him was in an online pet contest and got a lot of response, people couldn't believe he was a real dog. He posed just perfectly! In this picture, my friend's daughter dressed him up as a cheerleader, doesn't he look soooo happy? LOL! I think he's happier dressed as a boy! I know this isn't as funny, but Sassy was having a really bad hair day yesterday (lots of static and she needed a bath) and I snapped this right after she had a good head shake! Besides, I couldn't leave her out. LOL! Piggly Wiggly is not far behind, that's her baby. It's time for a givaway!! I chose this Christmas tree frame with "JOY" because I figured it could be used in any Christmas decor. I have sold many of this particular one, so I figured you would all like it! If you would like to be entered in for the drawing, just leave me a comment. I will draw a name next Sunday and ship it to the winner on Monday. Good luck to all of you, I wish I could give you all one!! If you would like to see more of my work, visit my Etsy store. I will be updating it regularly. The link is on the left hand side under "My Links." Hi Guys! I just wanted you to know how much I appreciate each of you and your sweet comments. I've been really busy lately making things for a christmas show I'm doing Friday and Saturday with a group of ladies. I have over 60 items! Next week I can get my house cleaned and back to some serious blogging. LOL! I just wanted to show you my gold tree in the computer/t.v. room where I'm at most of the time. It is done in angels, crosses, stars and nativity scenes. The rest of my house is fun, but this tree represents the real meaning of Christmas. It's kind of in a tight corner and I'm not sure the elephant fits in.LOL! Also, I'll be taking my Etsy store down for a few days. I'm taking all of my inventory to the show. I should have it back up soon. I'll be talking to you guys later! Hi everyone! I have lots of pictures to show you. I love hearing from all of you!! This is our dining room . The table runner is sprinkled with little fabric stars. I've collected all kinds of ornaments over the years, some were gifts and some I bought. Sherry found these Spode plates for me at TJ Maxx for 6.99 each! I took this picture from outside. My niche all decked out! Here are my bookcases with some Christmas touches. This santa in the hot air balloon is one of my favorite christmas pieces. I sell these frames on Etsy. I'm going to be giving one away soon, look for that next week! I found the snowmen at TJ Maxx and made this arrangement. I decorated the tops of the presents with poinsettias, ribbon and stars. I didn't realize I liked stars so much. LOL! I have been seeing tassels like these around town and on Etsy, so I thought I would try and make myself a few. Nancy at http://southernlady-nancy.blogspot.com/ makes beautiful handmade tassels and sells them in her Etsy store. 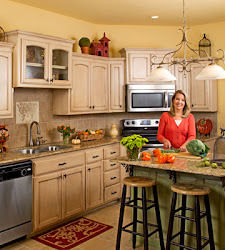 She has a great blog, her home is beautiful, if you haven't visited her you should! I found this cute reindeer pick at a Christmas show this past weekend and decided to put it in this plant. Even Sassy is decorated, look at her Christmas bow! I hope you enjoyed this long post and maybe you got a few ideas?! 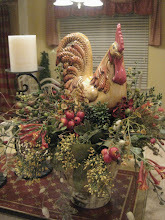 After Thanksgiving I'll show you my kitchen and I will also have a blog giveaway. I still have some pics of my friend's (big) home and I will be decorating my parent's house soon. Stay tuned......... Thanks so much for your visits, I'm enjoying getting to know all of you! Have a wonderful and blessed Thanksgiving.